Routine maintenance is a key element to making sure things run smoothly. It is very important in almost every aspect of our lives. Think about your car. We all know it’s important to maintain our cars and any other machinery we may own. They simply don’t work without gas or other important elements. If we want to go somewhere, we need to know that there’s gas in the tank and air in the tires. We make it a priority to put enough gas in the car to insure we don’t run out. The heating and air conditioning systems in your home need regular maintenance, too. The filters need to be changed at least twice a year. I signed up for regular maintenance visits from a local HVAC company here in Atlanta. I love that I don’t have to think about when to schedule maintenance. They call me. Another way to keep the machinery in your home running smoothly is to sign up with Home Zada. This program will send you scheduling reminders regarding the machinery in your home and so much more. The benefit is that you don’t have to remember when you last cleaned the lint out of the dryer vent or flushed the hot water heater. All of this is to avoid costly repairs down the road. Weeding the garden beds and trimming the hedges regularly keeps your garden looking lovely. When you have a schedule for taking care of the garden it doesn’t take that much time. If you avoid doing these chores you end up with a garden that is over grown and will cost you a lot in time and effort! Three things top my list for personal maintenance; getting my hair trimmed regularly so that it looks nice, exercise so that I stay in shape, and plenty of sleep. I schedule exercise into my daily routine as often as I can. I also try and get plenty of sleep at night which means I’m usually in bed early because I love to get up early! Everyone’s personal schedule is different. What tops your list for personal maintenance? It could be a weekly exercise class, yoga, book club, sewing circle, regular manicures and pedicures, facials, or massage. Write me back and let me know! Regular check-ups are not my idea of fun, but they are important and can be life-saving. About eight years ago my general physician told me it was time I had a routine colonoscopy. I grumbled but reluctantly scheduled the procedure. The doctor performing the procedure found a tumor in my colon which had to be removed. Thankfully, the tumor was benign. I’m very grateful that my doctor pushed me to have that routine check-up. Regular eye exams can catch eye-sight problems when they are easy to treat. The same holds true for regular mammograms, dental check-ups and other diagnostic tests. It’s always easier to treat a problem when it’s found early. I schedule all my routine health check-ups every year. It helps when the physicians send out reminder emails but if they don’t, put a reminder in your phone or calendar to schedule these appointments for yourself annually. We typically only notice clutter when it is overwhelming and a real problem. Make picking up and putting things away part of your everyday plan. If you have young children, plan to take a little time after dinner to put toys away, clothes in the laundry basket, and lay out clothes for the next day. You will be surprised by how much more smoothly the morning will go when you’re not tripping over toys and scrambling to figure out what everyone is going to wear! My colleague, Jonda Beattie, has a home maintenance program she calls ‘The Zone Plan’. She divides the home into ten zones and focuses on spending one month on each zone. She gives herself and her zone plan participants December and July off! This is a wonderful plan as you spend a concentrated amount of time in one area of your home. When the month is over you move on to another area of your home, knowing that next year you can revisit that zone. The thing I love about this is that by the end of the year you will have looked at most everything in your home once. It gives you the opportunity to de-clutter and find homes for the belongings you are keeping one zone at a time. Maintenance is a key component to making the things – all the things – in your life run smoothly. There are some tasks I didn’t reference (like laundry) in putting this blog together. You know as well as I do that if you do laundry regularly it doesn’t take that long, if you put it off until you have no more clean clothes it can take all day! Why torture yourself? Commit to making maintenance part of what you do, a little at a time. I promise you will save time and money. We often talk about getting our lives organized, the how-tos and systems for making things run smoothly. However, the key to keeping things moving along well is the maintenance piece. The maintenance is essential! I love how you’ve detailed this out in so many ways. I have certain maintenance things well worked out. I set annual reminders to “make doctors’ appointments” like for eyes, internist, GYN, and mammogram. My car has an automatic indicator when it’s time for service. My husband handles some of the routine house maintenance things like getting the boiler cleaned, changing the house filters, or cleaning out the dryer vent. Just recently, I did a partial winter/fall to spring/summer clothing switch. That was another opportunity to edit and maintain the closet and drawers. I love that Home Zada can send reminders about maintenance. That’s so useful! Thank you, Linda. The maintenance piece is key! I’m all about routine checkups. I have them scheduled at each visit for the next one. When I injured my back organizing over 15 years ago, I started getting a massage. Now it has become a habit for me. It’s necessary. I make sure I have an appointment set up before I leave the appointment as well. 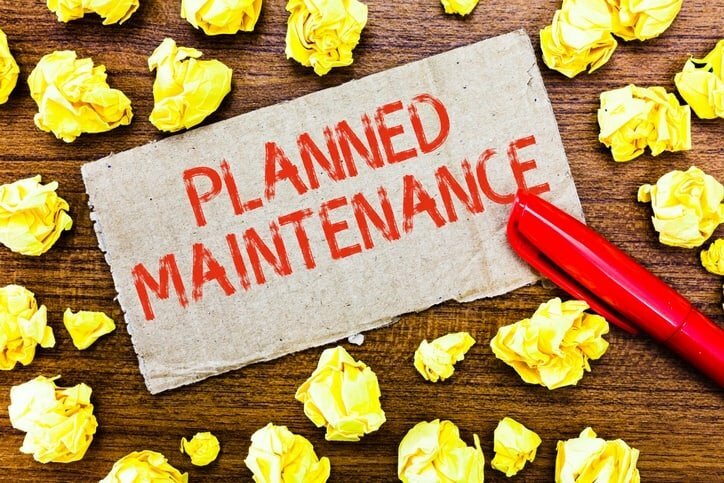 I can relate to both planned and unplanned maintenance. This week I schedule my annual service on my oil burner: planned. Then I pressed the button to raise my garage door and I saw a broken cable hanging before my eyes: unplanned. Both require attention. Delayed maintenance usually leads to compounded problems. It isn’t easy, and can be expensive, but maintenance pays rewards over the long term. You pay with the time you spend on maintaining things. I think of it this way – Maintenance is so much cheaper than fixing things once they have broken down. Kind of the same meaning as that saying, “if you don’t have time to do it right, when will you have the time to do it again.